An historic Coventry pub is set to be turned into studio flats as it is "unviable" as a booze business. The Old Crown Inn, on Windmill Road in Longford, has been standing since 1914. But now it is set for a new lease of life as a house of multiple occupation (HMO). 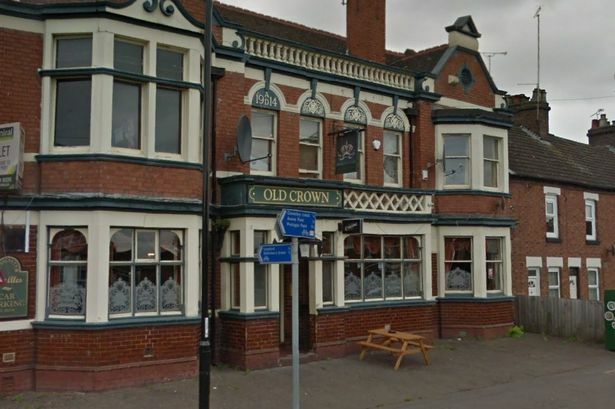 A report prepared for Coventry City Council's planning committee says the pub is now "unviable". It says trade has declined by around 50 per cent over the last decade, and there is too much competition locally for the pub to survive even if it could start providing food. Nearby residents had worried that it would be used as a halfway house for ex-convicts or a rehab centre - with 166 submitting a petition against the development. But those behind the project - APSE Building Design Ltd - previously told neighbours they have nothing to fear and the flats would be used by local people who are unable to get onto the property ladder. The application to change the building's use has now been recommended for approval by councillors who will meet on Friday, February 15, to decide its future. A marketing report by the developers states that Admiral Taverns had "determined that the business was failing and that it had become an 'end of life' premises". Council officers say they agree that running a pub at the site would be "unviable". The pub will be transformed into a HMO with 11 studio apartments and nine car parking spaces if planning permission is approved on Friday. An office building will also be created to allow on-site management of the site. The former pub, which was used as a recruiting post during World War One and sits just 50 yards from Longford Park Primary School, has already been stripped out. A temporary stop notice was issued by Coventry City Council in October and no work has been undertaken since. The developers will need to demolish post-Edwardian ground floor additions to the original structure and build a single storey ground floor extension at the rear of the property to make it viable as a HMO. There will also be changes to the internal layout. The project is now recommended to be granted planning permission as council officers say it will not adversely impact on neighbours, the area or highway safety. I thought conversion work had already started? rebbonk wrote: I thought conversion work had already started? A bizarre planning committee meeting rejected plans to turn a historic Coventry pub into flats – despite trying to go back on its initial decision. A plan was put forward by developers APSE Building Design Ltd to transform The Old Crown Inn, on Windmill Road, into 11 ‘studio apartments’. The plans included an office for a site manager, but concerned residents feared this meant the scheme could in fact be a hostel. At a planning meeting on Thursday, a late representation from the developer said the apartments would be let to ‘single, professional people’. Officers recommended the plan be approved, with evidence demonstrating the now vacant pub - which opened in 1914 - is “unviable”, with sales declining some 47 per cent from 2009 to 2018. But councillors were torn, with Cllr Gary Crookes stating: “I do understand the concerns. “For an 11 bed HMO to want management – we are not used to that. Planning officer Liam D’Onofrio told councillors a hostel could not be legally run without further planning approval. After a vote, three councillors voted in favour, with three against, and one abstention. Due to the tie, the chair’s vote was the casting vote. Cllr Harvard said his reason for refusal was as he was “not really convinced…it is aimed at teachers”. Why do I get the feeling that there is more behind this than is being made public? rebbonk wrote: Why do I get the feeling that there is more behind this than is being made public? I remember something similar on McDonnell drive about 25 years ago! People power stopped that as well. Yes I recall the one in Mc Donnell Drive. My daughters friend told her that a Paedo half way house is going there a leek to local residence from some one from the council.